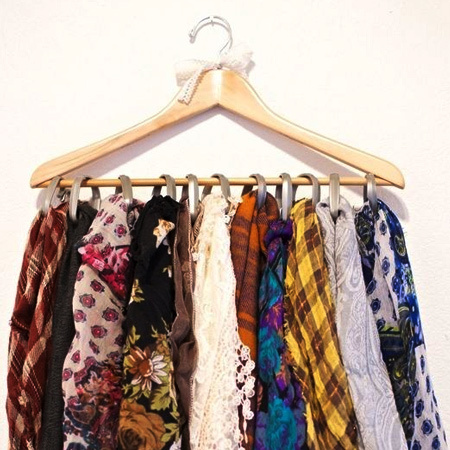 Most homes have basic built-in cupboards for closet space and many don't have plenty of space, so here are a few space saving ideas for closets. 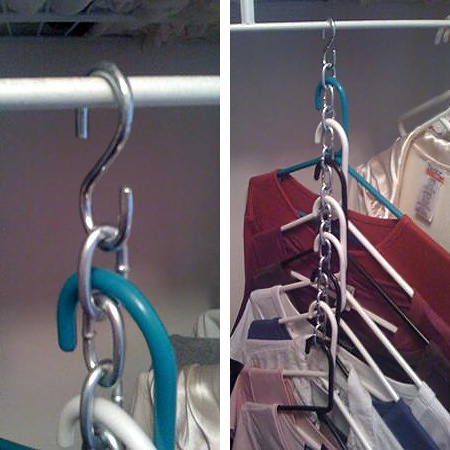 ABOVE: A length of chain and an 'S' hook, all of which you will find at your local Builders and you can easily install a system that allows you to hang more in your closets. 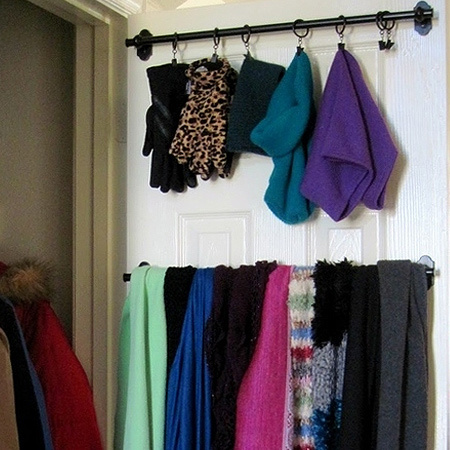 ABOVE and BELOW: Use the space on the back of closet doors to install hanging rods for scarves, belts and accessories. 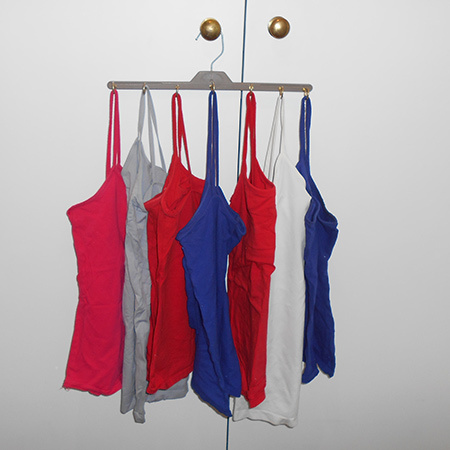 Strappy tees are a 'must-have' item for my summer wardrobe. They get stuffed into a drawer and then I rummage through the piles to find one to wear. 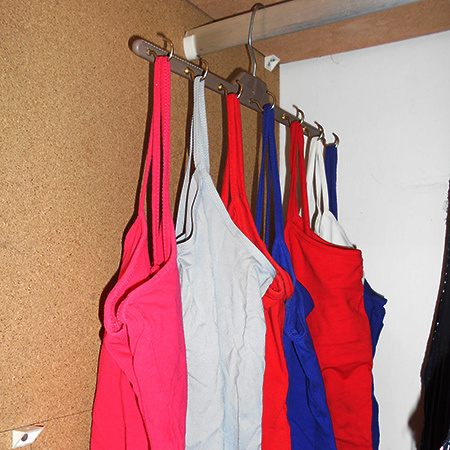 This leaves my drawers in quite a state, so I decided to make a strappy-T hanger that you can also use for tank tops and vests. 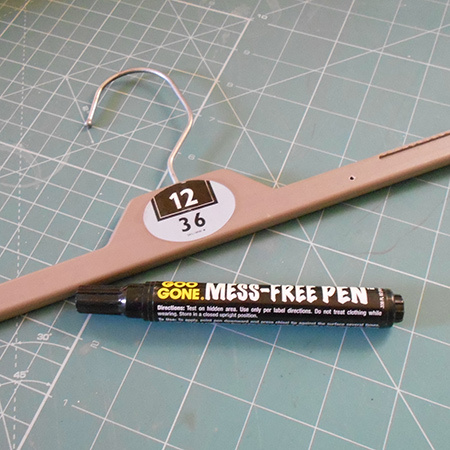 To make the hanger I re-purposed a plastic clothes hanger. Many clothing stores give you these when you buy clothes and they normally end up in the dustbin. Now you can recycle these plastic hangers to organise your closet. 1. Remove any labels. I use Goo Gone to easily peel off sticky labels. 2. 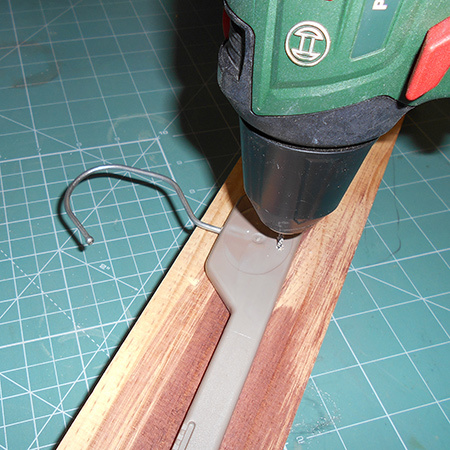 Use a 2mm HSS bit to drill holes along the length of the hanger. 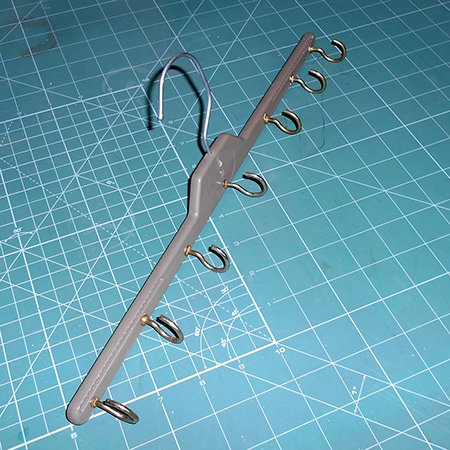 I plan of adding 7 hooks along the length of the hanger. Place a block of wood underneath the hanger when you drill. 3. 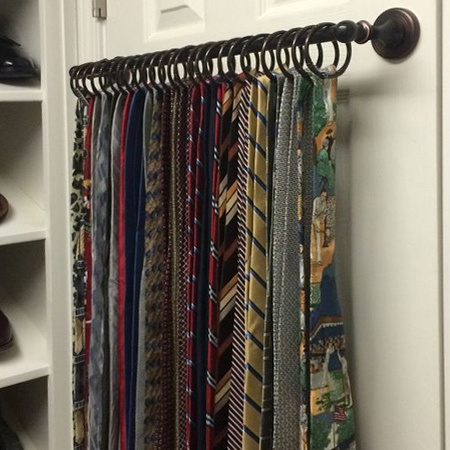 Screw the hooks into the hanger. If you have a Dremel MultiTool and sanding disk / grinding stone accessory you can use this to blunt the end of the cup hooks behind the hanger. They aren't very sharp, so you could always leave these as is. 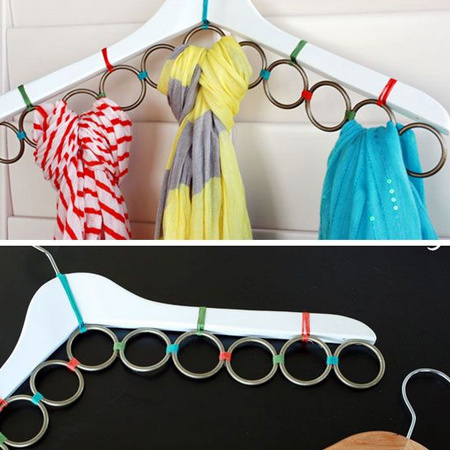 ABOVE and BELOW: A wooden coat hanger and curtain rings make a space saving scarf rack. 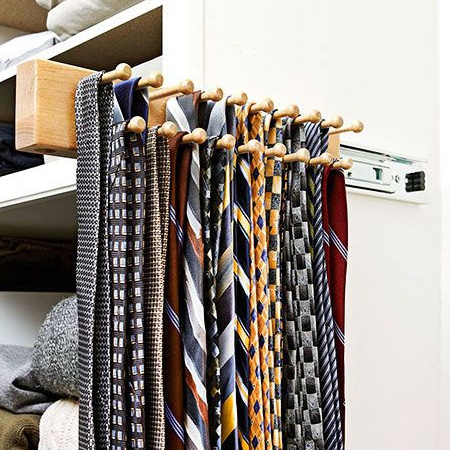 BELOW: A length of 44 x 44mm PAR pine and some pine dowels are all you need to make this compact tie rack. Mount to the side of the closet - or to the back of the closet door - with brackets. 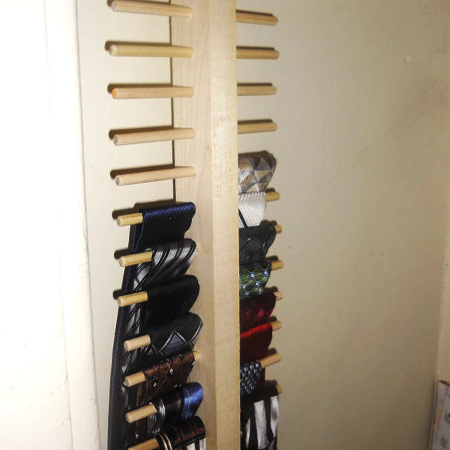 BELOW: This tie rack is made using a piece of PAR pine and pine dowels mounted onto a ball-bearing drawer runner. Brilliant idea! 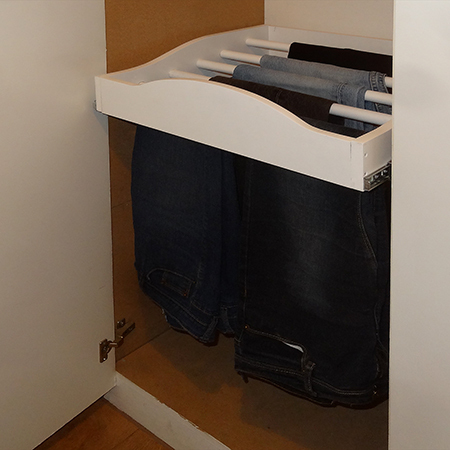 BELOW: Find instructions on how to make a pull-out trouser rack, and also how to fit ball-bearing drawer runners here.